Today’s grape-y goodness is sponsored by Grapes from California! Doesn’t get much better than those sweet, bursty California-grown grapes. Just please take note of what you’re seeing in the picture above. Golden brown skillet chicken ✔️ with a red wine pan sauce ✔️ on a layer of golden caramelized onions ✔️ with fistfuls of happy red California GRAPES ✔️. What to even say right now? It’s so regular + easy and so fancy + pretty all at the same time. The perfect dinner for company! This recipe was inspired by one of my favorite-est ways to make chicken, which is this Skillet Chicken with Bacon and White Wine Sauce situation. 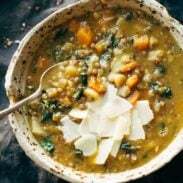 But there are a few key differences – with this updated version, I’m going for a few warmer, cozier herbs, swapping white wine for red, and switching out the bacon for grapes. I mean, if you wanted to still add the bacon, I definitely wouldn’t be mad about it and I might even awkwardly ask you if I could come for dinner to try a little bite or five hundred. Prettyplease. Buckle up – I’m going to get geeky on you for a second. Did you know that 99% of fresh table grapes that are commercially grown in the US are grown in California? Yet another reason to love to that sunny paradise land. Side note: in case you are wondering how polyphenols became a part of my vocabulary, I have my experience teaching a fourth grade nutrition unit to thank for that. Seriously, some of the random fourth grade tidbits I know about elephant seals and volcanoes and the science of rocks… you just never know when you might need those little nuggets of info. I mean, maybe you’ll use that word polyphenols someday when you become a food blogger. Who can say? No, I’m annoying. I’ll stop. Seriously now: Vitamin K. Antioxidants and other polyphenols. 90 calories. TASTY BITES OF JUICY GOODNESS. The list of benefits is just straight up 🍇🏆💯🍇🏆💯! Let’s talk about the GCO (grape cooking options). First option: you put them into the pan when it goes into the oven and they get roasty and soft. The good news about that is that they simmer in the sauce, so they’re juicy and delicious and they go together with everything on your plate really nicely when served with some kind of rice or quinoa as a side. It just works. The only potentially meh factor with this approach is that they lose some of their color. Which leads us to the second option. Second option: you put them into the pan just during the last few minutes of baking so they retain their beautiful color and most of their crispiness. They stay beautiful and vibrant and crispy, just how we like grapes to be. If you’re into a more crisp grape, this is the way to do it. What you see pictured in this post is the second option – I added them at the end of the baking time so they’d keep some nice color. But both Bjork and I were really impressed with how good the grapes were with the first option (roasty, soft, less color). I think we might have even preferred that in terms of taste and texture. It was like seeing grapes in a whole new light. You know what you like, so you choose how it’s done. Either way, it’s going to be Yum City because GRAPES. Golden brown chicken. Caramelized onions. I mean, honestly. Really hard to go wrong. 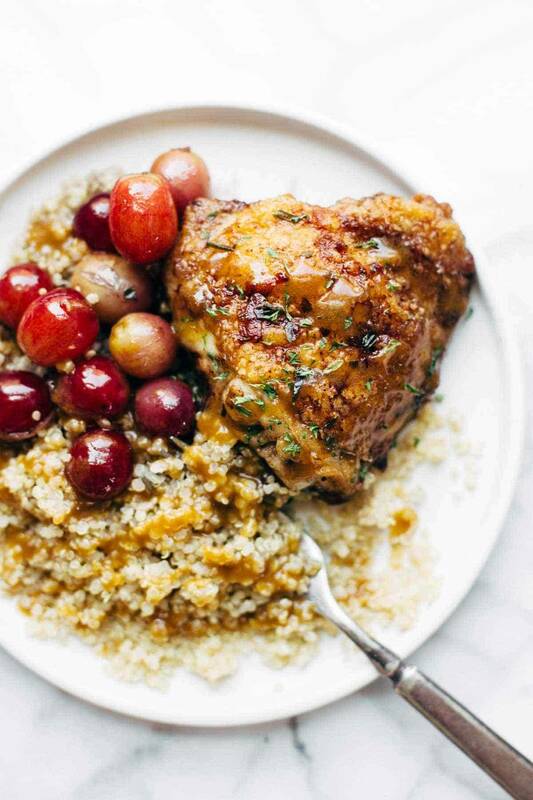 Skillet Chicken with Grapes and Caramelized Onions – an easy recipe that makes a perfect pair for a crisp green salad, quinoa, or fresh bread! To caramelize the onions, heat the butter over medium low heat in a heavy ovenproof skillet. Add the onions cook for 20 minutes or so, stirring occasionally. When the onions are a deep golden color, remove from the pan and set aside. To make the chicken, preheat the oven to 400 degrees. Combine the flour, salt, chili powder, thyme, allspice, and black pepper. Dredge each piece of chicken in the flour mixture, shaking off the excess. In the same pan as the onions, heat the oil over medium high heat. Add each piece of chicken skin-side down and fry for a few minutes until golden brown; flip and cook for a few more minutes. Transfer to a plate (if it’s not fully cooked, that’s okay – it will finish in the oven – the idea here is just getting it browned on the outside). Turn the heat down and let the oil cool off a little bit. Add the wine – this will definitely bubble and sizzle! Add the broth and simmer until the mixture is thickened slightly. Add the onions and chicken to the pan (skin side up) and bake for 20 minutes. Remove from the oven, add the grapes, baste with the sauce, and bake for another 5-10 minutes. Top with parsley and serve with a green salad, bread, quinoa, rice, etc. In the last picture, the chicken is drizzled with an olive oil balsamic type dressing that I used on our salad just to give it a little extra something. It was essentially 2 parts olive oil, 1 part balsamic, and 1 little spoonful of Dijon mustard. This looks amazing, I love the little bit of sweet from the grapes and quinoa is the perfect side to absorb all the flavors! Thanks Stacey! Appreciate that! 🙂 Agreed about the quinoa! Hi Dawn! Just make sure you aren’t using a sweet wine. Popular dry red wines include Pinot Noir, Malbec, Zinfandel, and Merlot. Hope that helps! We are in love with this chicken recipe!!! And your photography makes everything so gorgeous!! Love that you are showing a lesser known/understood way to use grapes in cooking other than eating them directly out of the fruit bin. Which is not cooking at all. Also like that you explained that cooking them with the dish is probably more delicious for every day cooking but adding them after is probably better for company (or blog photos haha). Options! I love them! Exactly! So glad that got communicated accurately 🙂 Enjoy Meg! This looks like a a perfect dinner, Lindsay! I have been loving grapes this summer, especially purple and red. Also, I love your former-teacher nutrition knowledge! Sometimes when I tell people about how zucchini are actually fruits because of the seeds inside they look at me funny, and I just wonder WHO their first-grade teacher was that forgot to tell them that :). Teacher tidbits foreva!! Oh my gosh, you get it! 🙂 So funny. Major lover of the roasted grape and caramelized onion combo right here! I’m excited to try adding some skillet chicken thighs into the mix! Thanks Lindsay! hope you like it! I’m so happy to see a recipe with my state’s beloved grapes 🙂 I love grapes in chicken salad but I would have never thought to bake them. Can’t wait to try this!! Yay California! I don’t know why I don’t live there. What a gorgeous dish! I feel like this would be such a nice meal for fall. Are grapes in season in fall? I don’t even know. Caramelized onions, chicken and grapes – ALL in one dish! Oh be still my heart! This sounds fabulous! The only thing healthy about this dish are the grapes and quinoa! You haven’t said a thing about using organic chicken! Organic meats are the only way to go these days! Also using bacon is unacceptable as it was proven years ago that bacon is carcinogenic and the way they make it has gotten worse over the years! Antone who says they love this recipe and uses it, has their head in the clouds! 180,000 people a year diw from cancer, partly caused by eating meats like bacon, chicken with growth hormones, steroids and antibiotics! Obviously no one has seen a picture of a baby pig or a friendly chicken and developed an empathy for them and believe it’s ethically wrong to support the severe cruelty going on in factory farms and producers like Maple Lodge and Tyson Foods! Dairy foods are extremely bad for tour health too and consuming them also contributes to abuses of mother sows and their young. The sows wail for days while their babies while the babies are chained down or tied on a short lead so they can’t move their head or barely movevat all and kept in the dark, awaiting slaughter for veal! There are tons of vegan recipes online including vegan hot dogs and you can buy vegan burgers too or make your own or make vegan stews or chili’s which cost an eighth of a one made with meat and last in a pot for 3-4 days! Everyone should be drinking store bought (or making their own) almond, coconut, cashew, hazelnut or rice milk and buying cheese substitutes and buying or making coconut milk and ice cream! Sounds like you’re pretty passionate about veganism, Lindy. Have you ever thought about starting your own blog so you have a platform for sharing your beliefs? I could just give you one big HUG!! Good grief this recipe sounds great and I am a big aficionado of grapes. Drink it every night before dinner. I will be making your recipe without the “organic chicken”. Not everyone can afford the $4.99 a pound for meat. Hahhaaa you’re seriously so awesome Lindsay! I am really digging all of the flavors in this recipe. I’ve been craving caramelized onions lately and hey! Now I have an excuse to make them. :). Everything about this makes me want to do a happy dance. Super yum—I love roasted grapes, and this looks divine. Thanks so much for my Sunday dinner inspiration! Beautiful and delicious looking- must try it soon! Can’t go wrong with this amazing dish full of flavour! Um yum! Roasted Grapes are my favorite, although like you said, it doesn’t look as pretty. I’m gonna have to whip up this recipe for dinner sometime this week. This dish is SO beautiful! One of the things I love most about your blog are the pictures – you’re such a fabulous photographer, Lindsay! Sounds great. The recipe for roasted grapes and sausages from Barefoot Contessa is one of my favorite cold weather treats and this sounds like a nice, lighter variation more suited to warmer days. No I havent! I’ll have to check it out I’m always up for new food blogs-love yours… especially all the pictures???? thanks for the suggestions! Happy Friday! I would never have thought to eat chicken with grapes, but you’ve convinced me it works. The dish looks beautiful! One of the great post Again Lindsay. This looks go good! What an interesting combo to combine the grapes with chicken. I can’t wait to run out and get some grapes to try this recipe!